When deploying an Azure Kubernetes Service cluster you are required to use a service principal. This service principal is used by the Kubernetes Azure Cloud Provider to do many different of activities in Azure such as provision IP addresses, create storage disks and more. If do not specify a Service principal at the time of creation for the an AKS cluster a service principal is created behind the scenes. In many scenarios, the resources your cluster will need to interact with will be outside the auto-generated node resource group that AKS creates. For instance, if you are using Static IP address for some of you services, the IP addresses might live in a resource group outside the auto-generated node resource group. Another common example is attaching to an existing vnet that is already provisioned. It would be simple to give Contributor rights across your whole sub or even individual resource groups and these scenarios would work but this is not a good practice. Instead we should assign the specific, least privileged rights to a given service principal. In the examples of attaching IP addresses, we may need the Azure Cloud Provider to be able to attach but not delete IP addresses because a different team controls the IP address. We definitely don’t want the Service principal to be able to delete any other resources in the resource group. There is a good list of the Kubernetes v1.11 permissions required here. This list shows the permissions for creating a least privileged service principal (note that it might change as k8s version change so use as general guide). Using this we can assign just enough rights to the service principal to interact with the resources outside the node group. This will allow the Service principal used to access the the IP Addresses in the resource group outside the node. note: to access the ip address in group outside the cluster you will need to provide an annotation on the k8s Service definition (service.beta.kubernetes.io/azure-load-balancer-resource-group). See the example. Check out the sample for a full walk through. Yesterday I had to revert to the command line to debug a program I was working on (long story as to why). I was initially apprehensive to debug from the command line but once I started I found the experience was quite nice. In fact I would compare debugging from the command line like “Vim for debugging”. Best part was I found the bug I was looking for! I was working in Golang so I used the awesome tool Delve which is used by the VS Code Go extension. I didn’t find a simple tutorial on using the command line so I’ve created this to help me remember next time I need to fallback to the command line. The following steps assumes you have set up your go path. Delve can be run in many different ways but the easiest is to use dlv debug. This takes your current go package, builds it, then runs it. You can specify command parameters by using -- <application parameters> after the delve paramters you pass. Type 'help' for list of commands. You have now built the app and entered the debugging experience. Easy enough if you are like me, you are wondering what’s next? With so many command how do I do start to do anything useful? 17: // Package stringutil contains utility functions for working with strings. 20: // Reverse returns its argument string reversed rune-wise left to right. That just touched the surface of what you can do but I hope it made you more comfortable with debugging on the command line. I think you can see how fast and efficient you can be. Good luck on you bug hunting! TLDR; The Azure Kubernetes Metric Adapter is a experimental component that enables you to scale your application deployment pods running on any Kubernetes cluster using the Horizontal Pod Autoscaler (HPA) with External Metrics from Azure Resources (such as Service Bus Queues) and Custom Metrics stored in Application Insights. Checkout a video showing how scaling works with the adapter, deploy the adapter or learn by going through the walkthrough. I currently work for an awesome team at Microsoft called CSE (Commercial Software Engineering), where we work with customers to help them solve their challenging problems. One of the goals of my specific team inside CSE is to identify repeatable patterns our customers face. It is a challenging, but rewarding role where I get to work on some of the most interesting and cutting edge technology. Check out this awesome video that talks about how my team operates. While working with customers at a recent engagement, I recognized a repeating pattern with in the monitoring solutions we were implementing on Azure Kubernetes Service (AKS) with customers. We had 5 customers in the same room and 3 of them wanted to scale on custom metrics being generated by their applications. And so the Azure Kubernetes Metric Adapter was created. One of the customers was using Prometheus and so we started to look at the Kubernetes Prometheus metric adapter, which solves the problem of scaling on custom metrics when you are using Prometheus in your cluster. The Prometheus adapter using the custom metrics api to scale instead of heapster. You can learn more about the direction Kubernetes is moving with custom metrics here. Two of the other customers were not using Prometheus, instead they using Azure services such as Azure Monitor, Log Analytics and Application Insights. At the engagement, one of the customers started to implement their own custom scaling solution. This seemed a bit repetitive as the other customer where not going to be reuse there solution. And so Azure Kubernetes Metric Adapter was created. 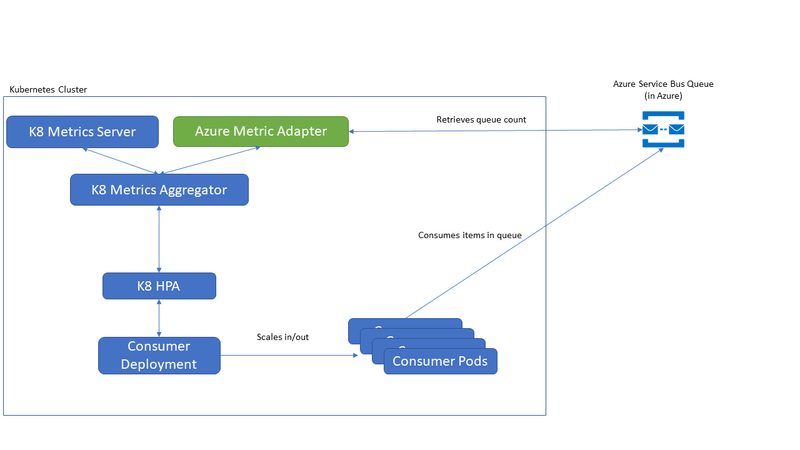 The Azure Kubernetes Metric Adapter enables you to scale your application deployment pods running on AKS (or any Kubernetes cluster) using the Horizontal Pod Autoscaler (HPA) with External Metrics from Azure Resources (such as Service Bus Queues) and Custom Metrics stored in Application Insights. The Azure Metric Adapter is deployed onto you cluster and wired up the Horizontal Pod Autoscaler (HPA). The HPA checks in periodically with the Adapter to get the custom metric defined by you. The adapter in turn calls to an Azure endpoint to retrieve the metric and give it back to the HPA. The HPA then evaluates the value and compares it to the target value you have configured for a given deployment. Based on an algorithm the HPA will either leave you deployment alone, scale up the pods or scale them down. As you can see you there is no custom code needed to scale with custom or external metrics when using the Adapter. You deploy the Adapter, configure an HPA and the rest of the scaling is taken care of by Kubernetes. It is available now as an experiment (alpha state - don’t run in production). You should try it out on your development and test environments and give feed back on what works, what doesn’t on github issues, and any features you want to see. There are two main scenarios that have been addressed first and you can see a step by step walk through for each, though you can scale on any Application Insights metric or Azure Monitor Metric. And your that’s it to enable auto scaling on External Metric. Checkout the samples for more examples. Hope you enjoy the Metric Adapter and can use it to scale your deployments automatically so you can have more time to sip coffee, tea, or just read books. Please be sure to report any bugs, features, challenges you might have with it. And if you really like it tweet about it, star the repo, and drop a thank you in the issues. Azure Kubernetes Service (AKS) uses the acs-engine project behind the scenes. Acs-engine is used as place to prototype, experiment and bake features before they make it into AKS. I was recently working on a project where we using AKS shortly after it went General Availability (GA). We saw strange behavior on our test cluster related to provisioning volume mounts and load balancers that we could not reproduce with newly created clusters. We checked the version numbers on Kubernetes/code/images but we could not find anything different between the clusters. We finally found that there was a difference between acs-engine versions of the clusters. This happened because the customer had created the cluster before the GA date. Recreating the cluster (and therefor getting the latest changes from acs-engine) fixed many of the inconsistencies we were seeing in the cluster with issues. Being able to compare the version numbers helped pinpoint the issue but the bigger lesson learned is to always recreate your Azure resources after a product goes GA. There are a lot of changes, fixes and releases that happen in the weeks leading up to a product release in Azure and the best way to make sure your running the latest software is to create a resource after the GA event. I have been using windows containers a lot in the last month and the other day I was asked how to do something. I don’t remember anything, I use a combination of GitHub, OneNote, and Bingle (Bing/Google) for that, so of course I started looking for the various examples in various GitHub repo’s that I’ve used and written. Turns out this is not very efficient. Instead, I am going to create this living document as a Windows Container Cheat Sheet (this blog is on GitHub so you can submit a PR if I missed anything you think is useful). It will serve as a quick reference for myself but hopefully can help beginners get a lay of the land. This first section has general links about Windows Containers, jump to the dev resources if your already familiar. The first place you should know about is the Official Windows Container Docs and info on licensing and pricing. To increase the speed of improvements and releases the team had to make breaking changes between versions. This means you have to match the host machine version to the container version. If you upgrade your host machine you can run older version of containers in Hyper-v mode. Read more about Windows Container version compatibility. There are several ways to download files. Soon you will be able to use curl. If you get the error message (currently any requests to GitHub): Invoke-WebRequest : The request was aborted: Could not create SSL/TLS secure channel. Soon you will be able to use tar. This also demonstrates how to set web.config files in asp.net. Set up a full pipeline in Visual Studio Team Services for Windows Containers. List of commands to run to see various state of your container. There is no UI so here are a few commands to get you started. Figuring out open ports and assigned ip addresses. There are some great tips on how to find logs and debug issues you might run into at https://docs.microsoft.com/en-us/virtualization/windowscontainers/troubleshooting.